Regardless of the size of your paycheck, not every penny you make is available to spend on what you want. What you have left after you take out all your must-pays — like taxes — is your net or spendable income. Don’t be lured into the common misunderstanding that your gross income and spendable income are the same. After you pay income, Social Security, and Medicare taxes on your gross earnings, you’re likely down a third or more. Then you need to account for the costs related to earning these wages, such as commuting, dry cleaning, meals out, and child care — just to name a few. You may also take a vacation periodically or treat yourself to regular massage therapy to “decompress” from the stresses of your job. The amount that remains after you deduct your job-related expenses is called your net, net income, or spendable income. 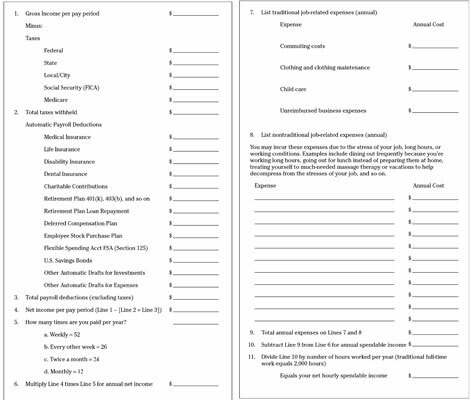 To figure out your net income, gather together two to four (if paid weekly) copies of recent paycheck stubs and complete the worksheet provided here with the information taken directly from your paycheck stubs. Some deductions occur monthly rather than per pay period, so two to four consecutive paychecks should reveal all deductions. For example, if you receive two paychecks per month and your medical insurance deduction occurs only with the first paycheck of each month, divide this amount by two when completing the worksheet. The example Calculating Your Spendable Income Worksheet illustrates that an individual who earns $52,000 per year ($26 per hour) may actually have less than $7 per hour remaining to spend on the daily necessities of life. This remainder is the number you need to focus on. Click here to download and print the example Calculating Your Spendable Income Worksheet. Another important conclusion illustrated in this exercise is the fact that only $1,138 per month ($13,666 divided by 12) is available to cover all the expenditures not shown elsewhere on the worksheet. This $1,138 per month is all that remains after the wage earner has paid income and Social Security taxes, taken into account automatic deductions from his paycheck, and adjusted for job-related costs. In this example, the individual is also investing 10 percent of his gross income into his retirement plan. He is also saving taxes by taking advantage of his Flexible Spending Account and depositing the maximum allowable amount for child care. Because of this, he also pays less in income taxes than he otherwise would have. 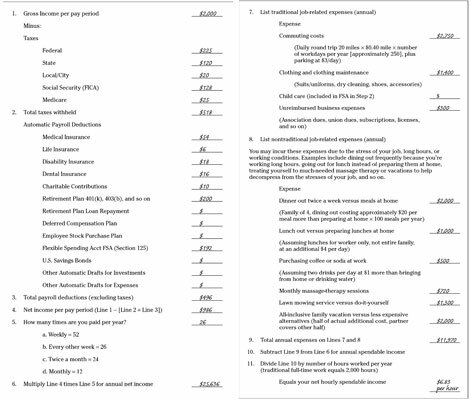 Click here to download and print a blank Calculating Your Spendable Income Worksheet. Next time you consider making a purchase and you tell yourself, “Ah, it’s only 20 bucks,” calculate how long it will take to net $20 — for the person in this example, it takes nearly three hours of work. Stop and ask yourself whether the purchase is worth three hours of your work life and energy.